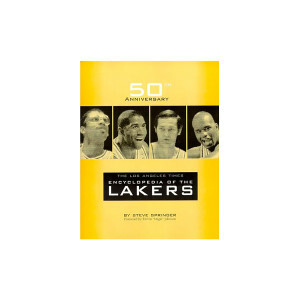 Get in-depth with the history of the Los Angeles Lakers in this 50th-anniversary encyclopedia. Through winning championships in three leagues and six NBA titles, the Lakers history is filled with hall-of-fame players and incredible sports moments. Learn about all of the Lakers legends from Wilt Chamberlain to the Showtime era to Kobe Bryant on this complete history of the Los Angeles Lakers! Get in-depth with the history of the Los Angeles Lakers in this 50th-anniversary encyclopedia. Through winning championships in three leagues and six NBA titles, the Lakers history is filled with hall-of-fame players and incredible sports moments. Learn about all of the Lakers legends from Wilt Chamberlain to the Showtime era to Kobe Bryant on this complete history of the Los Angeles Lakers! Foreword by none other than Earvin "Magic" Johnson! Expedited shipping available. Please select option, below, before adding to cart. Standard order processing times still apply. Not valid on international orders.